Though the upcoming Lifeblood expansion will have no shortage of interesting material, the Guristas Shipyards stand out. On Thursday, CCP is opening up the Guristas Shipyards – outlined in CCP Burger’s ‘Shipyards and PvE’ presentation at EVE Vegas – for a Singularity mass test. Unlike the Blood Raider test launch, the Guristas Shipyard will be available in three locations on Singularity. Based on the same Sotiyo platform as the Blood Raider Shipyards, the Guristas encounter will yield two million Singularity-only skill points, officer and faction modules. The encounters will also drop BPCs for the new Guristas capital ships: the fighter-launching Caiman Dreadnought, the Komodo Titan, and the Loggerhead Force Auxiliary. You can read more about the new Guristas capitals here. More importantly, though, the shipyard encounter will showcase advanced artificial intelligence. Pirate shipyards aim to operate several notches above standard ratting. 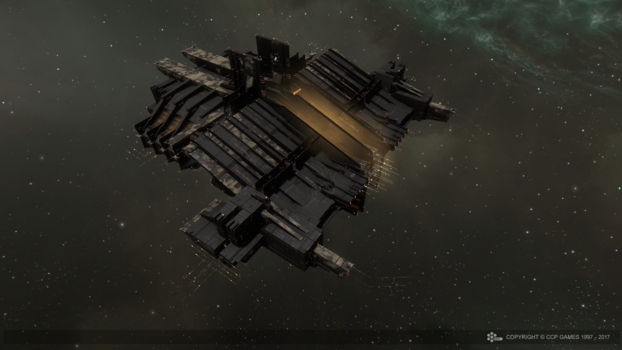 Last May, CCP opened up the Blood Raider Shipyard encounter. Kotaku outlined the chaos that erupted as alliances and the encounter’s AI adapted to each other’s tactics and impromptu doctrines. When a fleet of Punishers play a vital role, it’s clear that the game has pushed commanders into thinking outside the box. Expect NPC forces which engage on a system level rather than on a single grid, and expect them to spawn inconvenient fleets at inconvenient times. Though integrating shipyard-level AI into ratting sites and encounters would complicate the ISK-printing machines of many a rat farmer, that advance may well be on the horizon. CCP has certainly put emphasis on developing enemy AI over the years, from Seeker upgrades to Valkyrie bots. At Fanfest 2017, CCP Paradox stated that the AI team’s goal was “to create moments of crisis.” The system is designed to analyze incoming fleets and spawn the appropriate fleet to counter it. The intimidating part, so far as I’m concerned, is the challenge that AI developers face when trying to put limits on their creations. On the other hand, wouldn’t it be a heck of a thing to see the ratting life turn from automation or boredom to genuine risk? Jenne Exupery is a low-wattage independent who dabbles in shipping, salvage, trade, exploration, and nearly victimless heists. He can usually be found bumming around Derelik and Domain under one name or another. Preferred contact method: in-game mail to Jenne Exupery of Manticore-Horizon Shipping [MANHO].